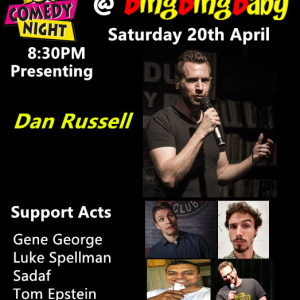 Dan Russell (Headliner) - From Boston, USA, Dan was a regular performer in New York City before moving to southwest China. Dan started his China stand-up career in Chongqing, where he lived for four years. He was the feature act for international tours in Southwest China, hence the nickname “Mr Comedy Chongqing,” and helped to found Chengdu Comedy Club. Now Shanghai-based, he performs regularly in Shanghai and other Chinese cities. Gene-George: From South Africa and Birmingham, UK, Gene is a veteran of both the Beijing and Shanghai comedy scenes and is a regular host and performer on showcases in Shanghai and around China. Luke Spellman: Yet another comedian from Boston, Luke is a frequent performer at Chengdu Comedy Club showcases and likes to draw inspiration from his liberal arts-filtered observations of society and culture. Tom Epstein: From the St. Louis, USA, Tom was a frequent performer at comedy clubs in Atlanta, Georgia before recently moving to Shanghai, where he has begun performing regularly.